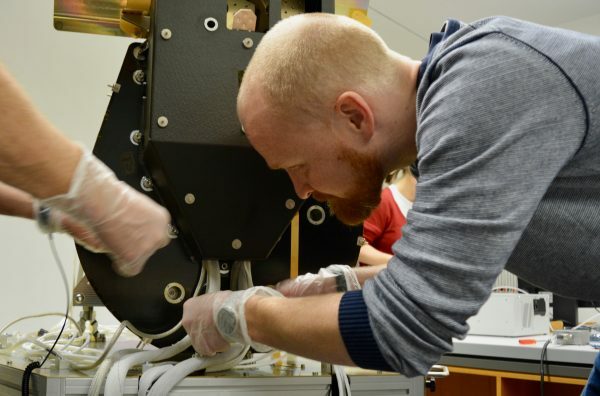 At the University of Bern, the CHEOPS team integrated all electrical and electronic parts into a model of the space telescope to test whether the different units and wires operate correctly and don’t interfere with each other. 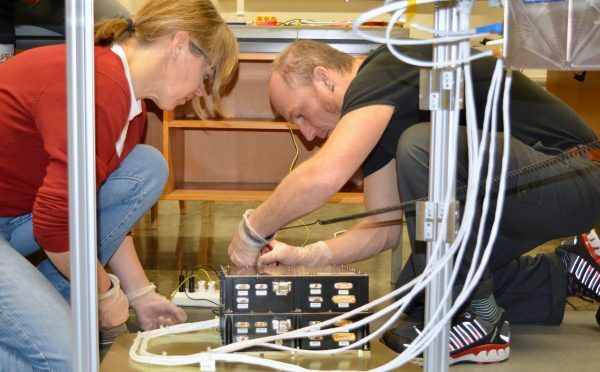 The electromagnetic compatibility test will take place in the second half of February in a special chamber at a Swiss centre in Regensdorf, ZH. Luca Malvasio has a look at the Back End Electronics. The non-descript black box attached below the telescope to what will be the spacecraft’s side panel is the instrument main computer and power converter. Called Back End Electronics, short BEE, it is the main interface to the spacecraft in terms of power and data transmission. It comprises the power unit that will convert the voltage provided by the spacecraft to the levels needed by the telescope as well as the main instrument computer that will analyse the CHEOPS images in real time and provide information for accurate control of the spacecraft pointing. The BEE is also responsible for maintaining a constant temperature of the telescope tube by powering heaters inside the tube. 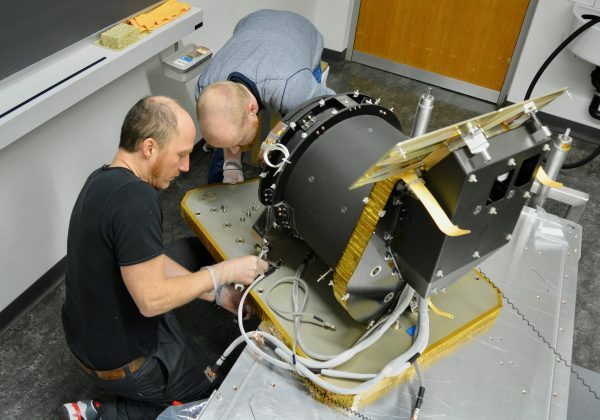 Although the heaters are already installed in the tube of the telescope, the engineers built a separate heater unit that operates in the same way and allows a quick testing of the software before the official procedure. This radiator sits on the floor but is connected to the BEE with the same kind of wires as will be used in the real spacecraft. 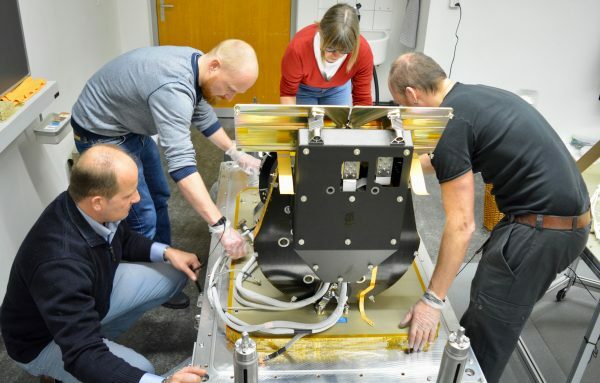 «Although it is only a test version, this on-board computer could almost be used for the real satellite», explains CHEOPS instrument manager Annette Jäckel. It was built by IWF (Institut für Weltraumforschung) in Graz, Austria, in collaboration with RUAG AT, and handed over to the team in Bern in January. «Now we are responsible for its proper functioning», says Annette Jäckel. Also below the telescope and attached to what will be the top panel of the spacecraft is another box, the Sensor Electronics Module, SEM. The little box is crucial for the operation of the detector. Built by DLR (Deutsches Zentrum für Luft- und Raumfahrt) in Berlin it controls the CCD detector that will provide the images for the mission. Furthermore it controls the temperature of the detector and the focal plane electronics by heating against 2 external radiators that cool the instrument to guarantee thermally stable conditions with variations of a few thousands of a degree. «It’s important that we use exactly the same settings as we will in the flight model to have reliable test results», says Annette Jäckel. It took the team several hours to link up all the wires to where they belong. The Electrical Qualification Model is connected to a laboratory computer sitting on a table next to it. 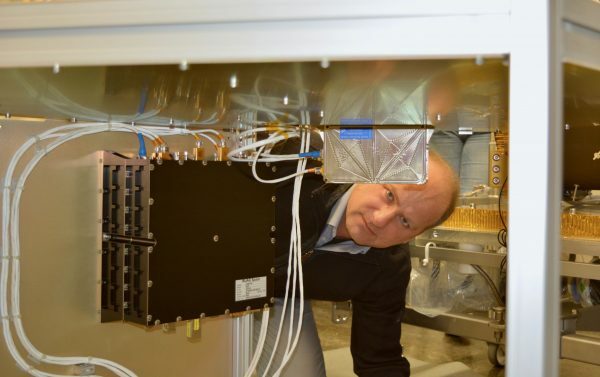 “This control unit simulates the spacecraft», explains CHEOPS project manager Christopher Broeg. The instrument flight software was developed by the University of Vienna, Austria. Once in the chamber at the EMC-Testcenter in Regensdorf, ZH, the heaters will be turned on and the telescope will simulate taking images although there is no mirror yet in the Electrical Qualification Model. A special antenna being circulated around the instrument will indicate whether there are interferences. Since the model is very compact it won’t be easy to trace the origin of a failure. «But here we have our emergency kit», explains Annette Jäckel, showing a series of switchboards that can be used to be placed in between wires and radiators and detect any disturbed connection. The switchboards including the appropriate cables and connections were especially compiled for this task at the University of Bern. 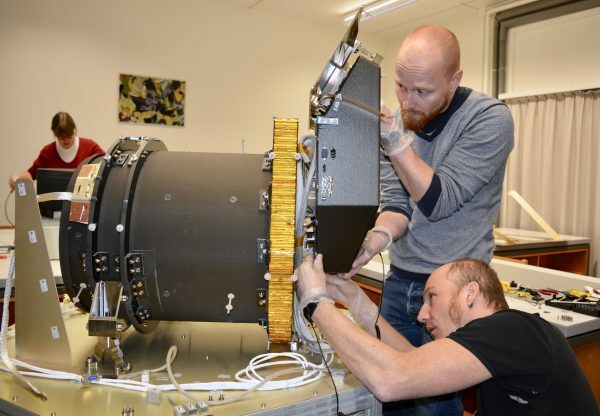 After the electromagnetic compatibility test, the CHEOPS team will eagerly wait for another important step: «In April, the telescope flight model should arrive in Bern», says Christopher Broeg. The optics are manufactured and integrated by the company Leonardo in Florence, Italy. 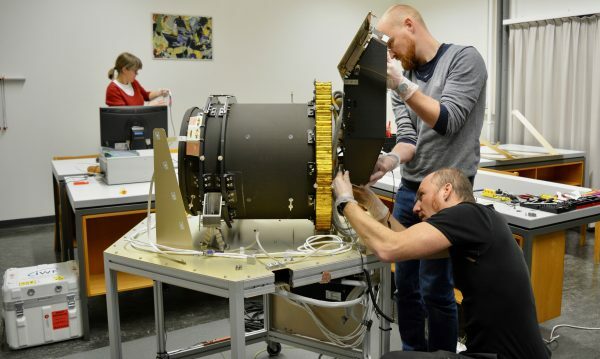 Once all the individual parts and systems of the CHEOPS flight instrument have been shipped to the University of Bern, the instrument integration and verification will take place. 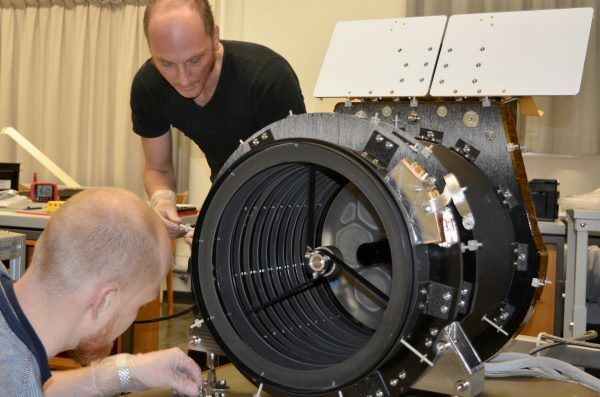 «The instrument should be essentially built, tested and calibrated by the end of December 2017», says Christopher Broeg. Launch of CHEOPS is now expected for end of 2018.